What should you include in an electrician business plan? How much can you earn as an electrician? What is an electrician business and who is it suited to? For many people, depending on how their mind is wired, the idea of a 9 to 5 desk job simply isn’t for them. It’s an old cliché, but when you work as an electrician no two days are ever really the same. An electrician’s main role is to install and maintain electrical wiring and appliances and, as you’ll need to follow technical drawings, building plans and wiring diagrams, having good practical skills and an ability to solve problems is absolutely essential if you want to succeed. You’ll also be required to read blueprints or technical diagrams and your role is likely to include the inspection of electrical components such as circuit breakers and transformers. Like most professions within the blue collar industry, a degree of scepticism exists among the general public with scare stories of cowboys and rogue traders. As a result, you’ll need to build up a reputable reputation amongst consumers to ensure repeat custom. Making sure you set up a profile on sites such as Check trade and Trust A Trader and keep on top of customer reviews. A broad industry, there a number of different services you can choose to offer as an electrician While some electricians focus on more domestic jobs, others will work on big corporate engineering projects. As the role may require you to be on 24 hour call out, a driving license and access to a car or van would be advantageous. When thinking about becoming a self-employed electrician, you’ll need to work out how you’re going to position yourself in the market – and what type of work you’re going to look for. Different styles of jobs require different qualifications and, as a result, you’ll need to have a rough idea from the outset of what area you want to operate in as an electrician (see below). Generally speaking, a domestic or residential electrician will work in private homes, flats and bungalows. As a result, these work environments are considered ‘safer’ than the work environment you would have if you were an industrial electrician as the distribution of power you’ll work with will be on the lower end of the spectrum, mainly dealing with 110v. This isn’t always the case though, as sometimes a domestic electrician will work on higher voltage systems for uses like heating, ventilation, or air conditioning. The main skill sets beyond basic electrical proficiency are the in-depth knowledge of electrical code and getting jobs done within budget. In contrast, a commercial or industry electrician is a much more specialised profession and his/her work environment will differ greatly – often in an industrial or agricultural setting. Generally speaking, more people choose to become a domestic rather than commercial electrician. While domestic electricians are also more likely to be self-employed, you’re more likely to receive a yearly salary and set hours if you go down the commercial route. Unlike other trades, some form of industry recognised certificate is legally required if you wish to officially qualify as an electrician. If you just want to work on domestic projects, then a qualification as a domestic installer or domestic electrician will suffice, although you won’t be able to bear the tag “fully qualified”. However, if you wish to work on all kinds of jobs including commercial, agricultural, industrial and domestic, then you’ll have to complete more courses and undergo more training. According to the National Careers Service, the first two qualifications in the list are accredited by the awarding bodies, City & Guilds and EAL. The third qualification is accredited by City & Guilds. These qualifications are normally completed while you are working. You may also need extra training if you want to do specialist work like installing environmental technology systems like solar panels. A common route into this work is to do an electrotechnical apprenticeship. This combines learning on the job with study at a college or training centre. It normally takes two to four years to become fully qualified. 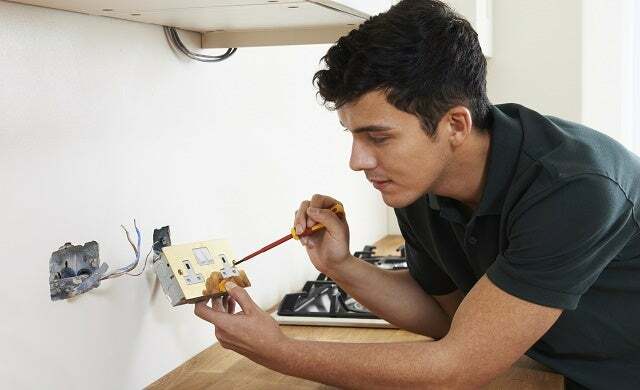 If you want to train as a domestic electrician, then you should register with one of the main Domestic Installer schemes like NICEIC or ELECSA. Once completed, you can start working and earning money in a much shorter space of time compared to the “fully qualified” route. However, your work will be limited to residential installations such as flats, houses, bungalows etc. You will, however, be able to work on anything from and including the consumer unit coming into a property. For many electricians’, despite being fully qualified, the most lucrative jobs are often in the domestic sector. The Joints Industry Board sets the standards for employment, welfare, grading and apprentice training, and it’s the JIB Grading that an electrician’s status is set against. Each grade has a requirement for both qualifications and experience for aspiring electricians to have achieved, for their JIB grading to be awarded. It’s important to note also, that an employer endorsement is required when making an application to be graded. The JIB handbook is a guide for all employment matters for JIB members and their workers and contains guidance on issues relating to the National Working Rules, grading definitions, industry training schemes, the JIB Benefits Scheme and more detailed information on employment law and practice. If you have qualified as an electrician outside the UK, you should register for the Joint Industry Board’s Electrotechnical Card Scheme (ECS). The card is proof that you meet the standard of qualifications and skills needed to work as an electrician in the UK. Finally, if you did decide to pursue training or education, ensure the course is accredited and endorsed by the necessary bodies. Don’t fall for any ‘become an electrician is just 10 weeks’ courses as these are often extremely expensive and not industry recognised – despite claims to the contrary. Much like other trades, the start-up costs for starting an electrician business can be relatively low. All you really need are some tools, some light marketing and a vehicle. If you are going to buy the tools outright it’s worth buying them from a specialist electrical merchant so you can ensure they’re the best quality, and specifically suit your needs. Companies such as ScrewFix and Wicks are a good place to start, and have branches nationally. You can also create a trade account to access discounted prices and credit for regular customers. Alternatively, online stores can offer tools and equipment at much lower prices as they don’t have to pay for gigantic retail outlets. If you’ve lined up an apprenticeship, it may also be worth asking your apprentice master where they buy their tools. One of the most important aspects of initially starting your own business is marketing and advertisement and becoming an electrician is no different. Get some flyers printed and distribute them door-to-door and on public notice boards in supermarkets. Local shops will also sometimes let you place flyers near on their counter or window. Think of any friends or family who own businesses who may be able to help you out in this regard. While you might not be inundated with calls immediately, people may hold onto your details and call you in the future. Most printing companies will let you print 1,000 flyers for as little as £15. While a vehicle isn’t compulsory, it would serve as an extreme disadvantage not to have access to a van – giving that you could be called out to anywhere at any time and will need somewhere to carry your equipment. Once again, what jobs you decided to accept will determine what type of van you’ll need. If your electrical business involves repairing domestic appliances and collecting larger items such as washing machines or large screen televisions, you may need a transit sized van. However, if you are only carrying hand tools and small items of materials then a smaller van will suffice. There are a number of finance options available for the purchasing a vehicle: asset finance spreads the cost over the period of an asset’s life. There are two types – lease finance and hire purchase – both are good options for start-ups with limited funds. Lease finance is where the asset company would buy the van for you and you agree to lease it for a certain amount of time and money; it is then your responsibility to keep it in good condition. This also has the advantage of VAT being reclaimable, and you can deduct the lease rental fee from taxable income. With hire purchase, the finance company buys van for you and retains ownership until you can afford to buy it off them. All you have to do is put down a deposit and pay off the balance and interest through regular instalments. Once you’ve paid the final installment you own the asset and are entitled to the tax benefit of claiming capital allowances. Once you have brought a van, it’s also a good idea to advertise on it. Have the vehicle either screen written or purchase some magnetic plates that show your business name, what your business does and a telephone number. While the initial cost could fetch a few hundred pounds, this will provide your business with 24/7 advertising. Remember to ensure you take extra caution while driving, however, as inconsiderate or danger driving skills may reflect badly on the business! Similarly, it would be best to keep your van looking clean as a filthy vehicle could once again send out the wrong message. When picking van insurance, it would be worth taking out contents insurance so you’re not left out of pocket if your tools are stolen. Our vans for business section is an excellent resource for advice, reviews and regulation information. As is the case with any trade business, the amount you will earn will depend entirely on how many jobs you manage to secure, what type of jobs you do, and where exactly you live or work in the UK. Newly-qualified electricians can earn between £19,000 and £22,000 a year and with experience, this can rise to between £23,000 and £30,000. NB: This is only a guideline. Once again, word of mouth marketing is extremely important: “Word of mouth is how I get most of my jobs, so it’s important to get your name out there and most importantly to be nice to people. It’s good to get your name known to wholesalers as well”, Pratley comments. There are national set rates to cover travelling time, travel expenses and accommodation costs.